We all die for the fancy visuals of our outdoors, so people are going crazy about outdoor landscaping projects which they can do themselves! Whether you are doing a gardening or outdoor renovation project, to have a secure storage space at outdoor is always our first priority where the supply materials, tools and other apparatus can be stored till their time of use! For garden lovers, this type of storage space is always provided in shape of garden sheds, the mini rooms built in the gardens! 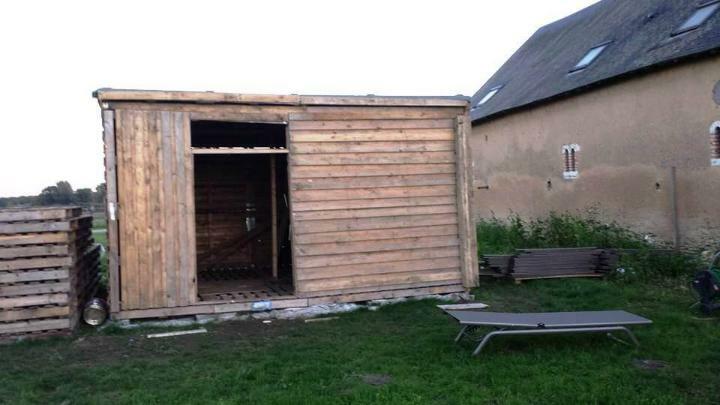 Want to build your own custom shed for free? 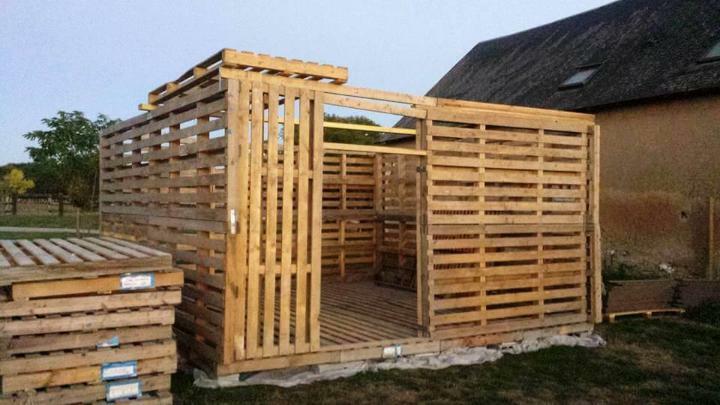 Checkout this easy DIY pallet garden shed tutorial, will highlight all the details for you if you want a quick and easy construction of your shed! 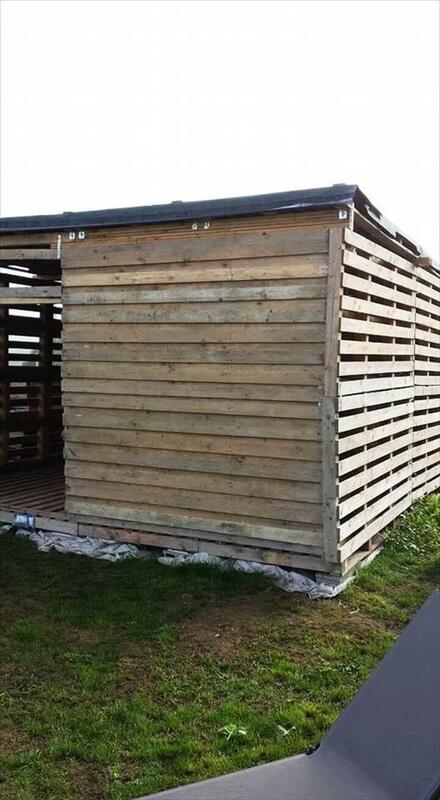 All you need some concrete blocks, an underlayment fabric, roof felt and lot of pallets! Once you gain the all supply materials, you can start the construction work which is all simple and beginner friendly! Take help from the given visual presentation of construction steps if you are getting puzzled at some points! 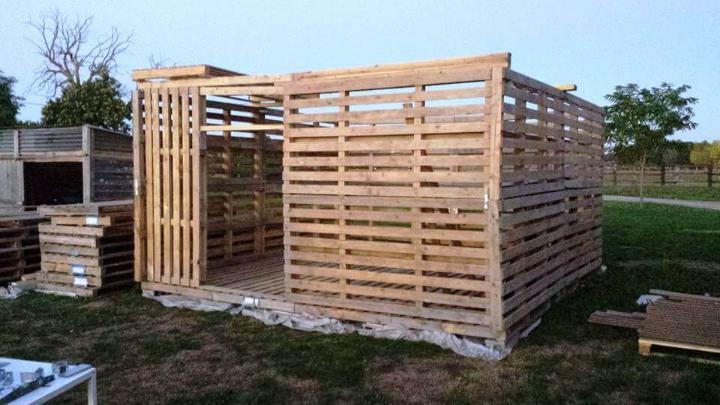 An amazing and secure place to store the garden all necessities like tools and materials, a pallet-made garden shed, is as robust, easy-to-build and low-cost as you want! 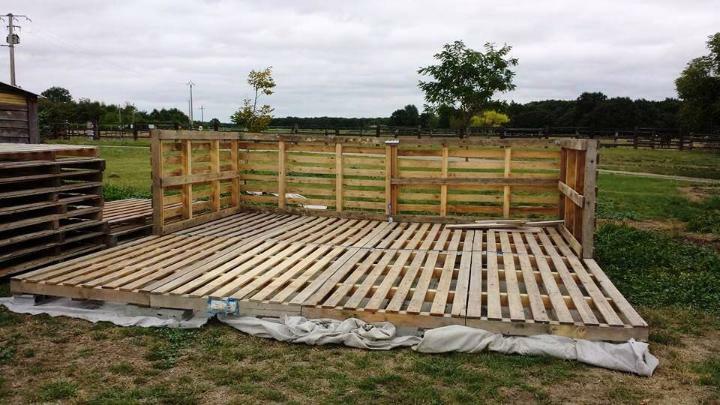 Prep the selected and precisely measured garden ground surface for an accurate pallet flooring, would be the actual base of the shed! Before the putting the pallets on the ground for shed’s base, the area has been covered with a underlay fabric! 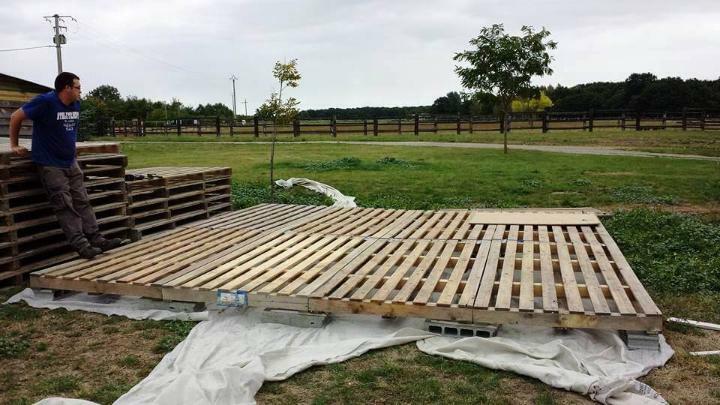 Add and remove soil to level up the selected area and then simply put together the selected pallet boards and line them up for a big square shape wooden base for the shed! Elevating the pallets on cement or concrete blocks is another way to make the base more stable and precisely balanced! 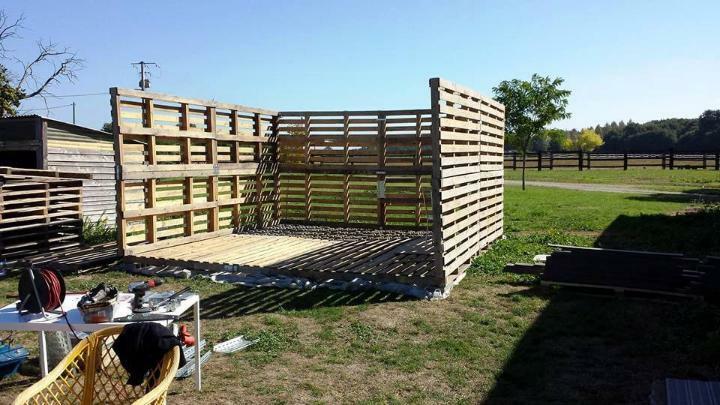 For building first corner or the primary walls of the shed, line up pallets vertically, here pallets can be treated as prefabricated panels for wall construction! Drill bolt holes in the bottom, top and sides of pallets jointed vertically and then add the bolts and don’t forget to secure them with locking nuts and washers! In the same add the 2nd row of pallets vertically over the primary one to bring the walls to completion! Add the number of nut-bolt joints to stabilize the walls more! 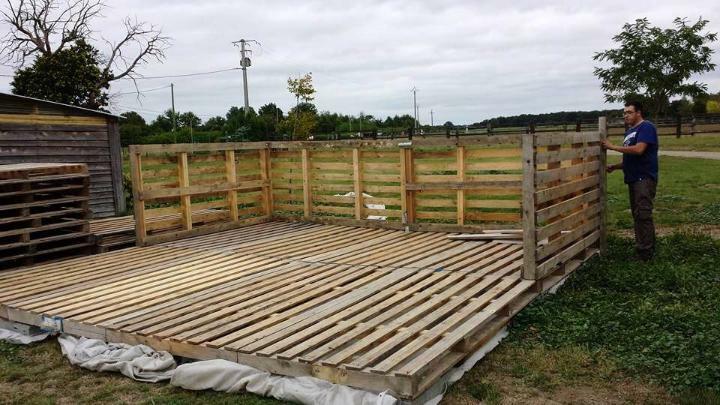 Here 2 layers of vertical pallets were enough for building sturdy walls of the shed! Use extra hardware like metal plates and screws and also extra wood like wooden beams to gain the corners lasting longer! 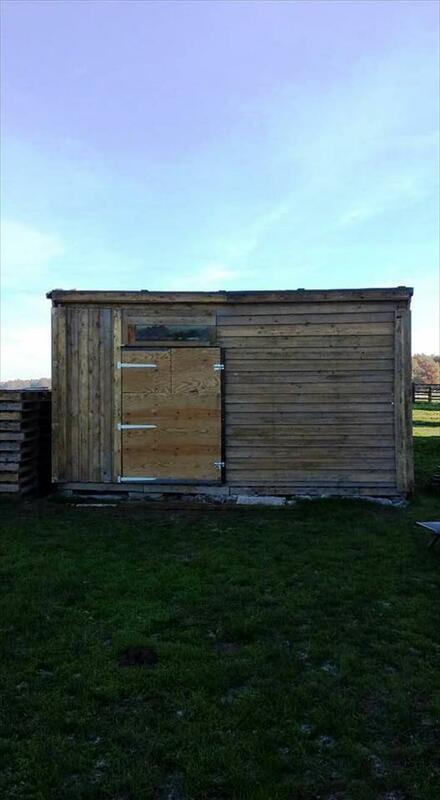 Load more pallets to build the front and just leave the space for front door!!! At the same time plan the primary skeleton for the roof, the most necessary and challenging part of the construction! 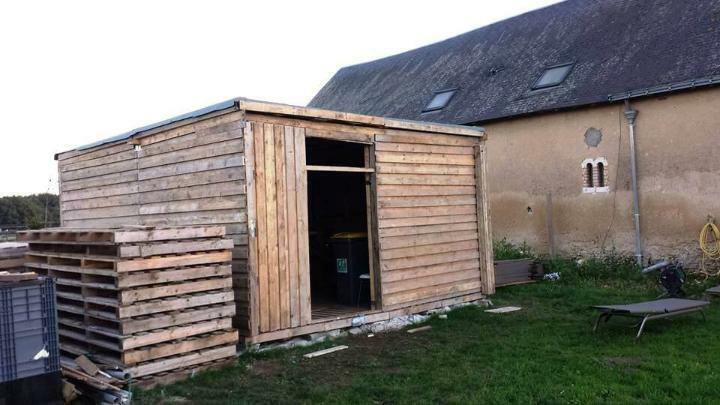 Longer wooden beams have been put straight across the side walls that divide the top of the shed in equal parts, easy to fill with uncut pallet boards, a whole better plan for the lasting roof! 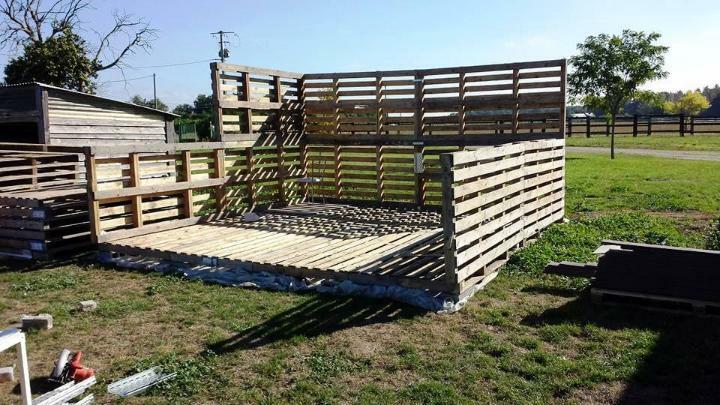 Keep on adding pallets over the installed wooden roof beams and just fill the entire roof area solid, finish it also with a waterproof fabric overlay! Elevate the front of the roof a little, so you can get the roof on a tilted angle that will not allow the retaining of rainwater that always cause a great damage to wood! 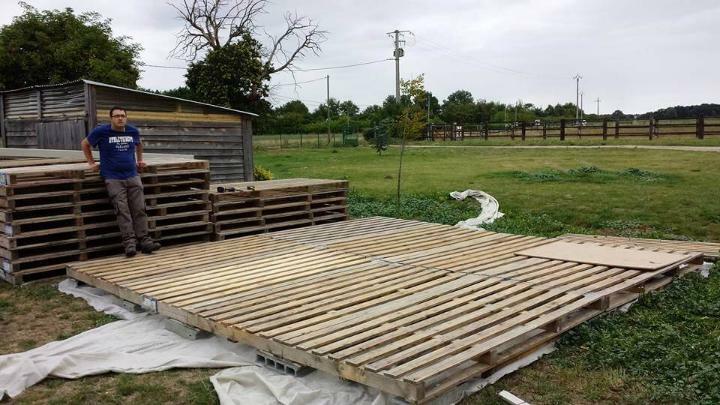 Now dismantle a lot of pallets for a big pile of straight pallet lengths, will come in handy for solid filling of entire shed as shown here! You can change the style of filling for amazing shingled touch to entire shed exterior! 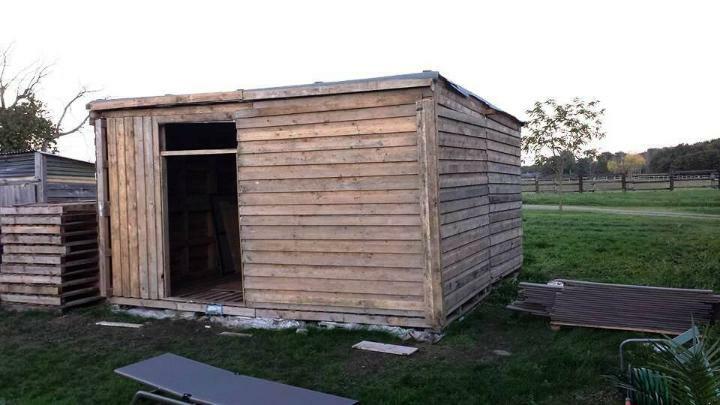 Finish the shed by adding the front door and also by applying custom wood finishing coats, would bring shine and protection to wood grains and hence a long life to shed!